Many times a nursing home resident is confined to bed or is unable to move themselves in bed, transfer themselves out of bed, or independently move while sitting in a chair or wheelchair. These residents must be turned and re-positioned at least every two hours to avoid pressure ulcers. The nursing home should provide the resident who is bed-bound or otherwise at risk for pressure ulcers with special cushions, pressure-relieving mattresses, specialty beds, and heel pads to prevent the formation of ulcers. 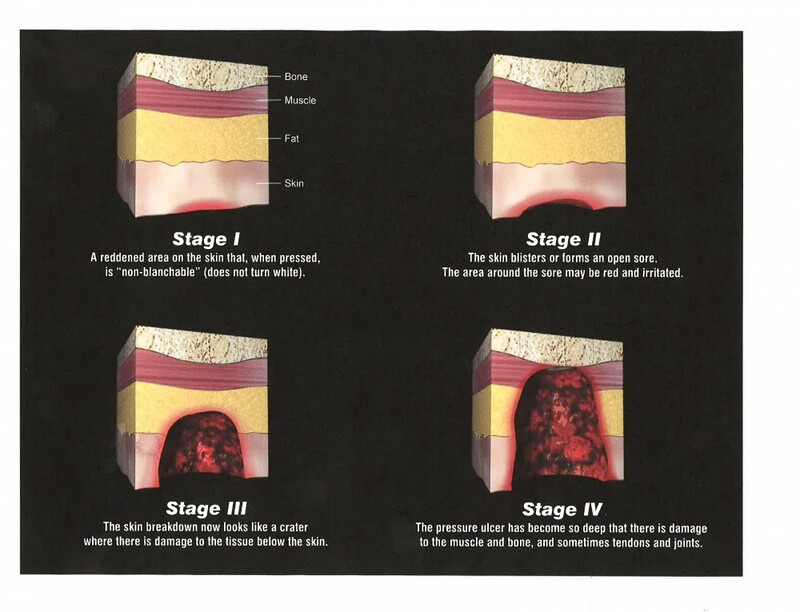 When pressure ulcers develop, they must be treated immediately to prevent infection and the worst outcomes. This is not only proper nursing practice; it’s also the law. What are bedsores and how do they develop? A pressure sore, commonly referred to as a bedsore or decubitus ulcer, is a breakdown of the skin caused by unrelieved pressure. Pressure sores most commonly form when nursing home staff neglects to turn and re-position a resident, allowing them to sit in a chair or lay in bed for long hours, a whole day, or even longer. Pressure sores usually occur on the lower back, buttocks, heels, and ankles, but they can also develop on other parts of the body. As these pressure sores become more severe, the risk of related infection and death increases. Nursing home staff are legally required to take precautions preventing bedsores and to aggressively identify and treat bedsores when they do occur. Proper nursing care and attention to the resident’s needs will often avoid these painful and potentially life-threatening injuries. Sugarman Law and its nursing home litigation team represent nursing home neglect victims and their families every day. We obtain compensation for those who suffer injuries and death from nursing home neglect and abuse. Has your mother, father, family member or friend been injured by a bedsore or other nursing home neglect or abuse? Please fill out the contact form or call Barry Sugarman and the nursing home litigation team at Sugarman Law at 732-877-1975. Sugarman Law obtains compensation for those who suffer injuries and death from nursing home neglect and abuse.